Hint: Keep it colorful, but classic. 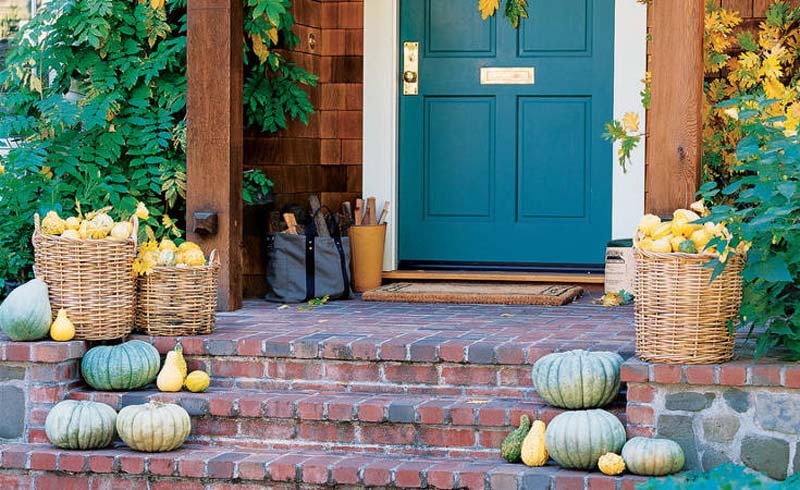 Transform colorful fall elements—gourds, flowers, and apple baskets—into a pretty fall door display. 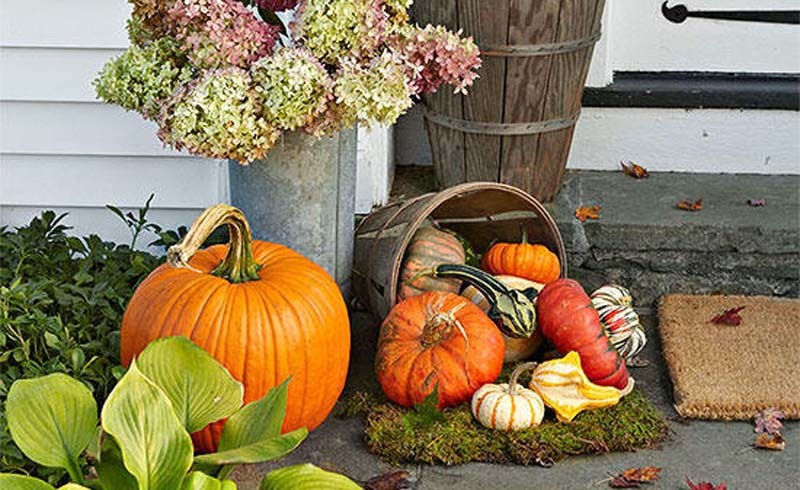 Our three no-fail tips will make your outdoor fall decorations the neighborhood standout. 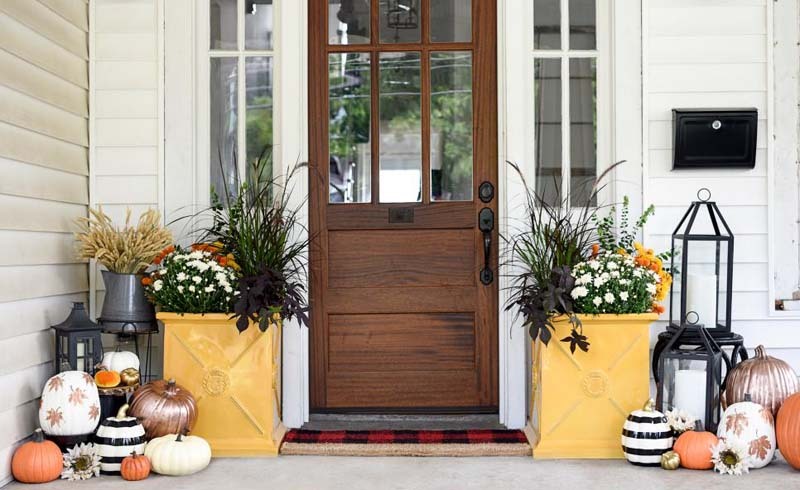 Signal to guests right away that you're ready for the season with this welcoming fall door. We’ve piled on the fall flowers, pumpkins, gourds, and a fall door wreath to show off traditional autumn hues. This front entry arrangement looks pro but can easily be done yourself with a few rustic props like wooden barrels and galvanized metal vases. And since it’s not holiday-specific, you can keep it up all season long—it works just as well for Halloween and Thanksgiving alike. Get the scoop on these three easy fall decorating ideas below. 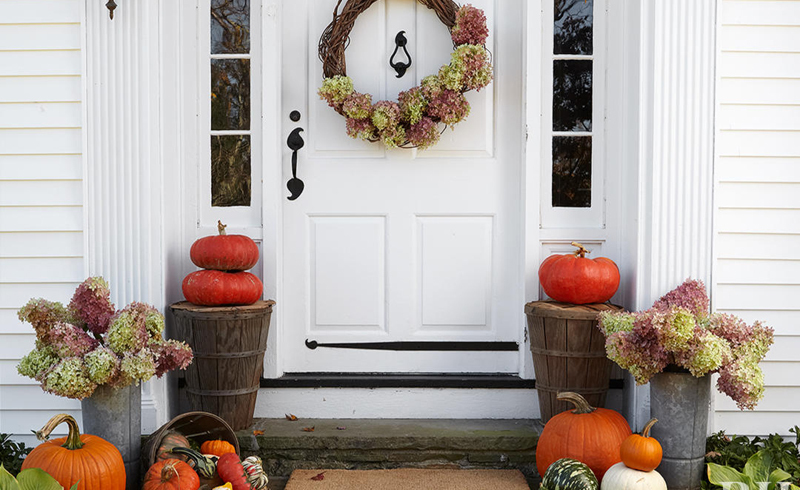 Various sizes of colorful pumpkins and gourds lead the way to this classic fall front door decked out in a grapevine wreath with dried hydrangeas. Make your door itself the spotlight by personalizing a large grapevine wreath. Keep it simple with some dried hydrangeas and an oversized ribbon bow in yellow, orange, or red. The benefit of starting with a simple wreath base like this is that you can add almost anything you want to it. Galvanized metal pails, apple baskets, and wooden barrels can add a bit of country rustic style to your fall decor. Staggering several tall galvanized pails and wooden barrels along the edges of your steps naturally frames the scene as you walk up to the front door. We filled two galvanized vases with the same type of dried hydrangeas from the wreath and used wooden barrels as pumpkin pedestals for a touch of fall farmhouse style. 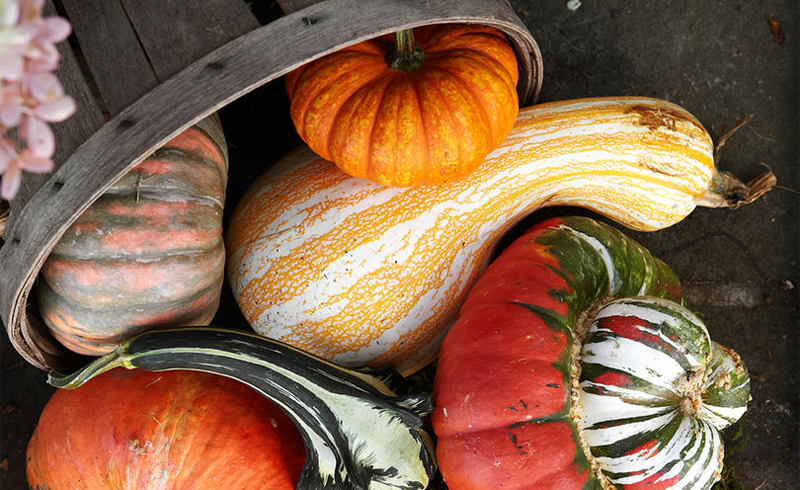 Stack pumpkins for extra height; layer colorful gourds for a new take on the DIY cornucopia. You don’t have to have perfect, identically-sized pumpkins on both sides of your door. Creating asymmetrical symmetry by balancing objects gives the look a more casual, relaxed feel. 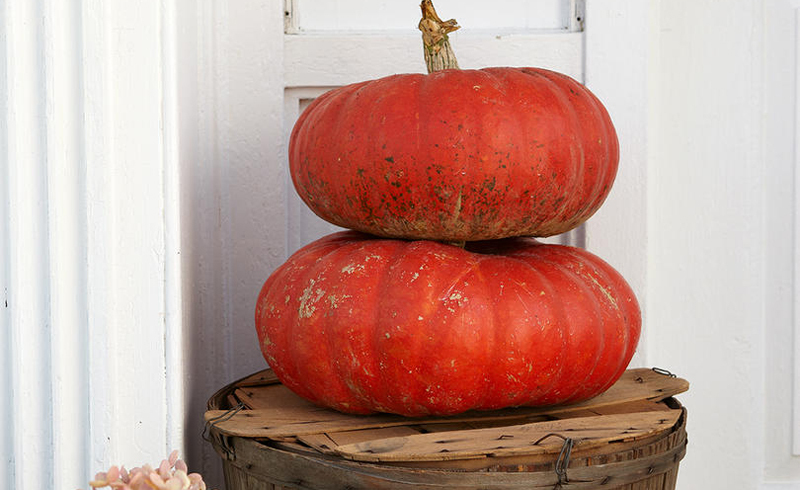 For example, two smaller stacked pumpkins on one wooden barrel balances out a larger pumpkin on the opposite side. Tip an apple bushel basket on its side to create a cornucopia of mini gourds spilling out onto a bed of moss. Balance that feature with a few larger pumpkins and gourds on the other side. Just remember that many smaller objects = the visual weight of a few larger objects, and your arrangement will be balanced just right.